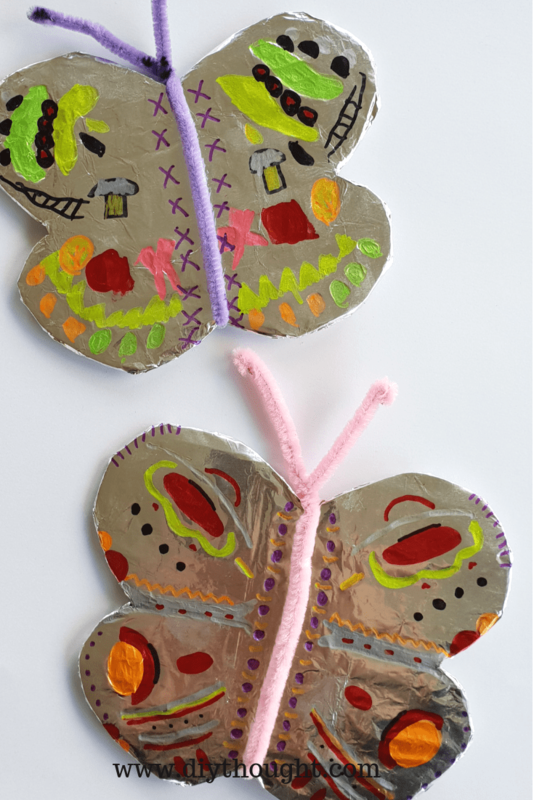 Learn how to make your own foil butterfly kids craft right here. 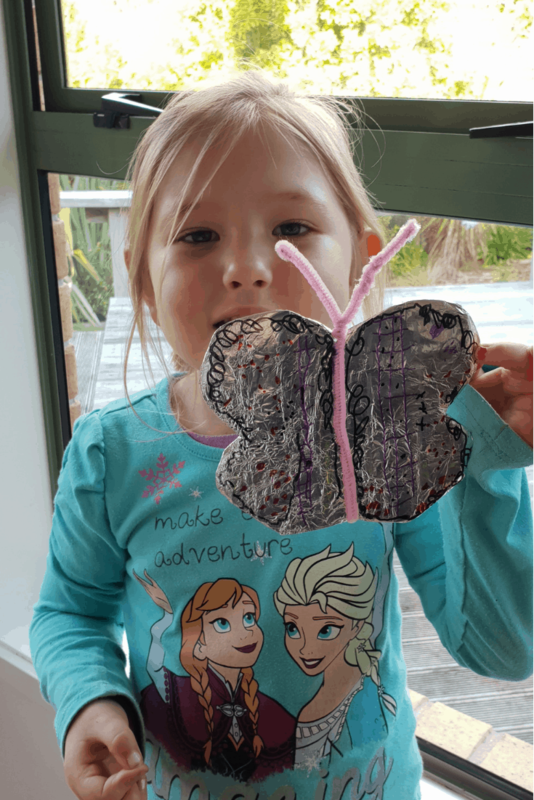 My children LOVE butterflies so when I came across this fish foil art I knew instantly how I would modify it for my girls. Lots of colorful arty fun, this simple craft activity kept my girls busy for ages. They loved it that much that we ended out making caterpillars and a chrysalis to go with our beautiful butterflies! 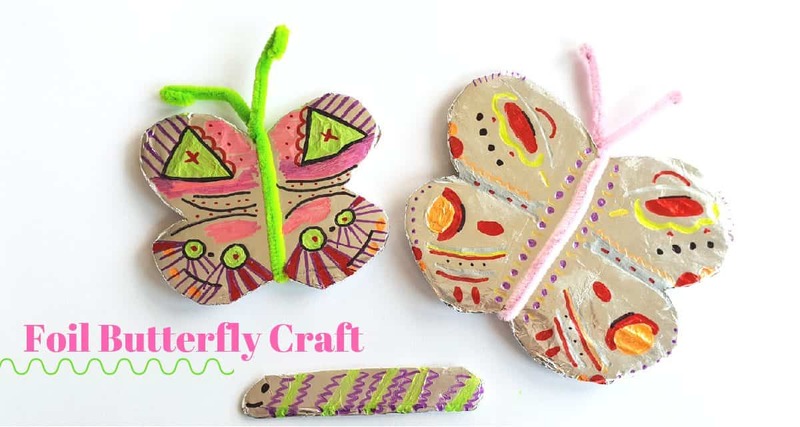 This is a fun craft which suits kids of all ages, right from young preschoolers to adults. 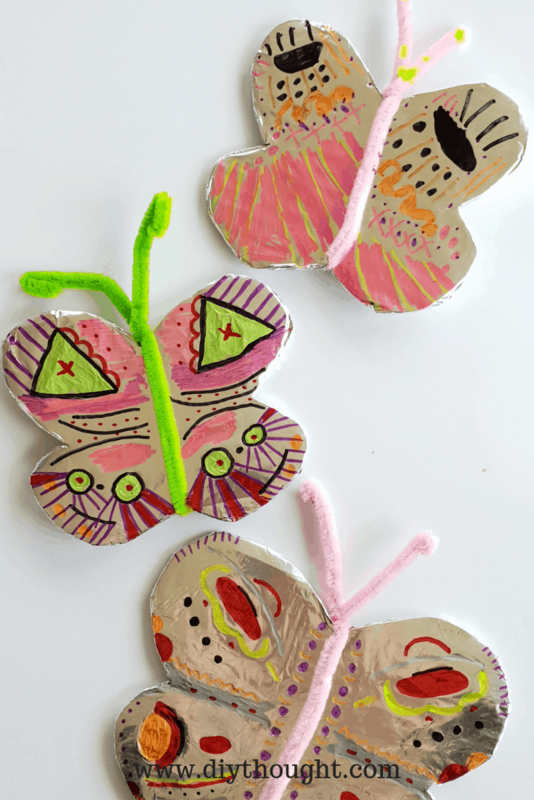 Cardboard butterflies are wrapped with aluminum foil and then decorated with permanent markers. How easy is that! 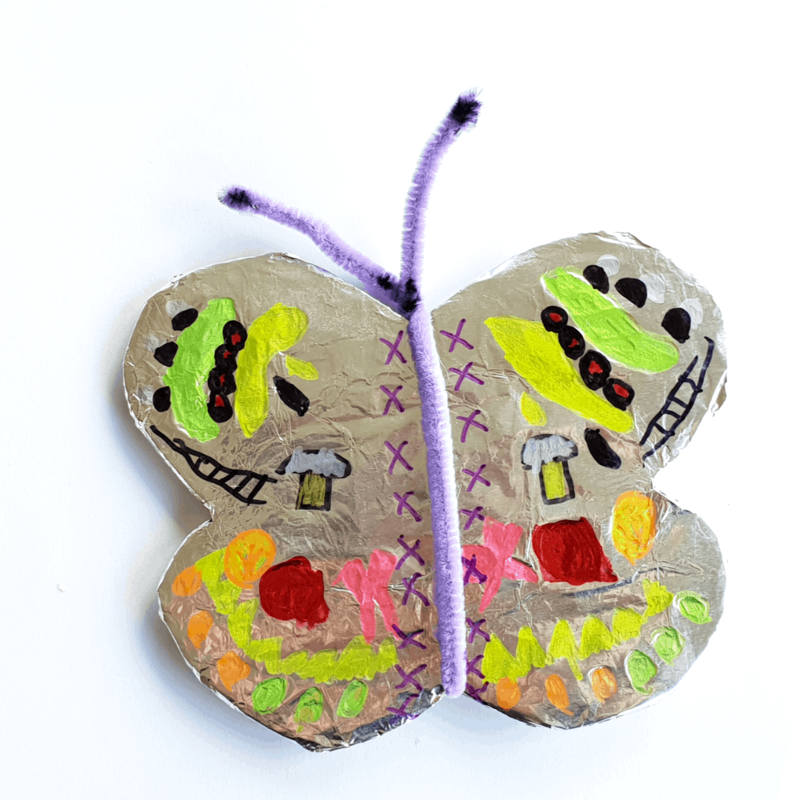 Keep reading to find out exactly how we made this foil butterfly kids craft. 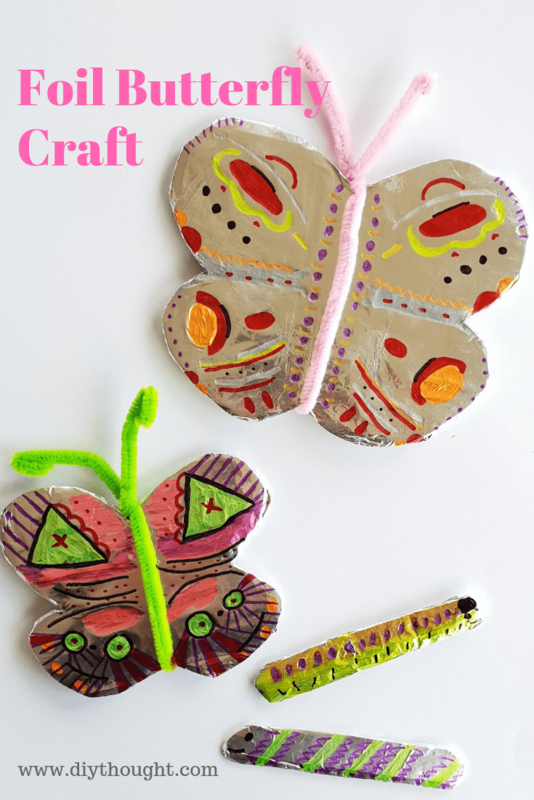 Foil butterfly kids craft is a very easy craft to set up and very inexpensive. Chances are you will have everything you need already at home! Follow the step-by-step photo and directions below. Cut the shape out and unfold. Place this on a piece of thick cardboard (from an old box is perfect) and trace around with a pen. Cut a piece of foil large enough to cover one side of the butterfly. Glue back edges of the cardboard and carefully wrap the excess foil around and press down to stick. You will need to cut slits in the foil at each butterfly corner to be able to bend and stick the foil neatly. Twist a pipe cleaner around the middle of the foil butterfly. Get creative decorating the butterfly with Sharpie pens. Older children will enjoy the challenge of making the pattern symmetrical while younger children can go wild and freestyle their drawings. Beautiful! I love the little caterpillars too. Thank you! Kids have the best ideas, I wouldn’t have thought to do the caterpillars without the girl’s input!